When The Zot speaks, a wise man listens. And lo, I did find at last that the work was done, and while it was not good, at least it was Tuesday, and thus it was good enough. And yea, there was a cloud overhead, and it appeared dark and foreboding, yet also exceedingly small, and thus I rode on, the work having been done. And thus I rode on, ascending along Simms Road toward the Elena Gallegos picnic grounds. ‘Twas then that The Zot spoke a third and final time. This entry was posted on July 18, 2017 at 5:50 pm and is filed under Just mumbling along. You can follow any responses to this entry through the RSS 2.0 feed. You can leave a response, or trackback from your own site. As a former USAF fighter jock, we used to say: “Flexibility is the key to airpower; indecision is the key to flexibility; and weather forecasters are the key to indecision”. Sounds like it applies to cycling as well. Yessir, when I see The Zot out and about, I seek shelter. Seeing a tree vaporized by a bolt from the blue when we lived on that rocky hillside near Weirdcliffe really focused my attention. Your sky showing off again. Riding in a t-storm is not smart. More times than I like to remember I’ve been standing on an aluminum ladder loading bikes on top of a van wondering if I’m about to get a really big jolt? So far, so good. Wise move, Perro Loco. 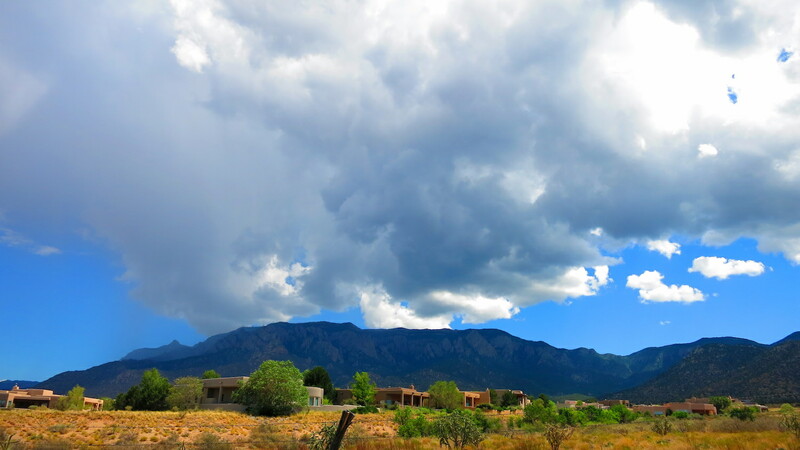 Glad there wasn’t any lightning about when we were on the Paseo del Bosque! i woulda turned around at the first boom. don’t put off the great zot. Good friend was at a stoplight three years ago when the lightest of rains began to fall. His rear wiper wasn’t cooperating so he scooted out back for a quick fix. There had been no “booms”, he took a “zot”. The nurse in the car behind CPR’ed him until the EMTs arrived. She told us later that soldiered on in spite of the fact that he was gone. The smell of burned hair was her clue. RIP, Gaylin. The Zot does not play. When I was 19 or 20, a fellow longhair and I were hanging patio covers and installing storm windows in Bibleburg. Back then you could set your watch by the afternoon thunderstorms. One afternoon we were setting the wrought-iron posts for a cover over a second-story deck. Long bastards they were, and the clouds were rolling in. “I don’t like the looks of this,” sez I. “Aw, we’re nearly done, let’s finish up,” sez my bro’, who was also the boss. ‘Bout that time I look at him, and he looks at me, and our hair was standing straight out from our heads, like a couple “Zap” comix characters who just pissed into a light socket. We dropped those posts and ran like yella dawgs for cover. We were camping in the Dragoons, and pressing our luck at the beginning of the monsoon season. A storm came up, and when the lightning and thunder became simultaneous, we bailed out of the tent and ran to the pickup. We watched a ball of lightning form on a boulder about 50 feet in front of the truck, and a split second later a bolt of lightning went up out of the ball. It was one of those “did you see that?” moments. We stayed in that truck until the storm had passed, then we packed up and headed home. Looks like Melissa McCarthy is going to have to find a new SNL skit.